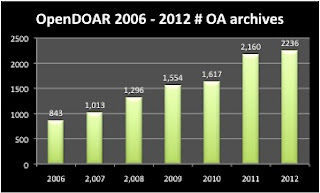 Updated Jan. 1, 2013 thanks to very helpful informal peer review from Pablo de Castro (E-LIS figure and explanation for discrepancy in growth rates of OpenDOAR and ROAR). 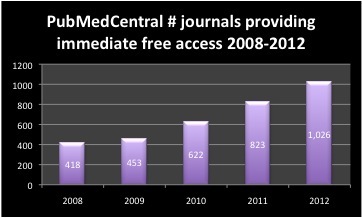 2012 was another awesome year for open access!. This post highlights and celebrates just how much open access is available already. 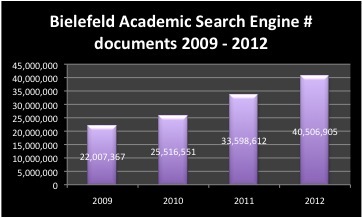 The Bielefeld Academic Search Engine (BASE) cross-searches over 40 million documents in over 2,400 repositories - nearly double the number in just 3 years, demonstrating yet again strong growth in open access archiving. The Directory of Open Access Journals, in addition to listing fully open access journals, provides an article-level search that is available for a growing percentage of DOAJ journals. 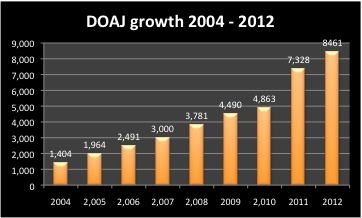 The number of articles searchable through DOAJ is just under one million - a third of this growth taking place in 2012 . What a great way to show that not only is the number of open access journals growing rapidly - more importantly, the number of articles published in open access journals is growing even more dramatically! A heartfelt thanks to everyone around the world who is making open access happen - all of the scholars sharing our work, readers, advocates, repository managers, publishers, librarians, and others. All the best to you and your OA endeavours in 2013! 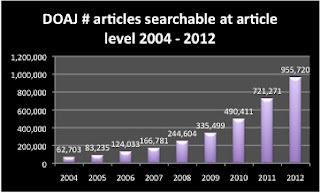 Directory of Open Access Journals - articles searchable by article level grew by 234,449 articles to a total of 955,720 articles, an increase of 33% on a substantial base. The Registry of Open Access Repositories showed a growth rate of 730 repositories or 28%, a somewhat puzzling contradiction to the relatively slow growth rate of OpenDOAR. The number of journals depositing all articles in PubMedCentral as open access grew by 191 to a total of 893, a 27% increase this year, and the number of paper downloads from the Social Sciences Research Network was more than 2 million higher this year than in 2011 (10 million downloads total), for a 27% increase. 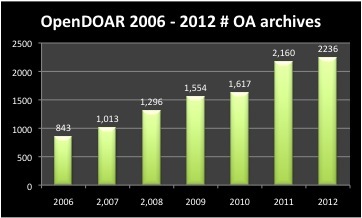 Pablo de Castro (see comments) explains the discrepancy in the growth rates of OpenDOAR and ROAR: the growth rate mismatch between ROAR and OpenDOAR is due to an intensive database cleansing by the latter towards the end of 2012 that led to removal of a number of wrong/outdated entries. Correction Jan. 13, 2013 - the correct number is .4% not .04% as originally posted. Thanks to Bryan Thompson (see comment below). Informal peer review of this kind is very much appreciated! There's a lot of math and a second pair of eyes always helps, especially since I often do this work quite late in the evening. This is .04% of the 7 billion people on this planet open access aims to serve! Note that internet access and literacy is required to take advantage of open access to the scholarly literature - but unlike Elsevier, open access is not placing barriers, we're just doing the best we can to overcome them. The process of globalization means that more and more of the important decisions made, are made beyond the national level, for example through multi-national trade treaties and international bodies ranging from the United Nations to the World Intellectual Property Organization. For democracy to thrive in a globalized world, democracy too must move beyond local borders. One proposal that I would like to offer is that the world needs to move beyond free trade to fair trade - not just for coffee and a few other goods; let's make fair trade the default. This is a huge task and I would not underestimate the difficulty of the journey. One strategy that I propose is to transition our free trade agreements, slowly, into fair trade agreements. Instead of a race to the bottom - companies looking for the lowest labour costs, poorest environment protection - let's raise the floor, use the advantages of being able to participate in global trade to leverage good practices for the environment and for people. This post introduces three elements that seem highly likely to enjoy support from those in power: currency fairness, local economy health, and eliminating tax avoidance. Update December 27: commitment to access to knowledge - thanks to Glyn Moody for the suggestion. Good point, many countries have made this commitment already. The optimum would be a complete and immediate reversal of direction globally. However, this may not be realistic. What might be realistic is incremental change, beginning with elements of fair trade that would appeal to the powerful players in the international arena. For this reason, I would like to suggest some elements that might appeal to those who have a lot of influence in global politics, such as Barack Obama. One is currency fairness. I understand that Obama is well aware of the global impact of China's artificially keeping its currency low. In the short term, the purpose would be to rebalance the global economy, in favor of the U.S., but in the long term, introducing one element of fairness could be a first step towards global fair trade policy. The current Trans Pacific Partnership treaty negotiations might be a really good time to bring this up. Another is local economy health. There are advantages to trade, but if free trade decimates the local economy (anywhere), what's the point? This is one area where the optimum is probably balance rather than all-free-trade or only local. Obama is concerned about jobs in the U.S., and the E.U. 's desire to protect local industries could help get support for this point. In a global economy it becomes far too easy for large corporations and wealthy individuals to avoid taxes through such means as offshore tax havens. Countries everywhere would benefit from addressing this problem, and the most effective way would be for all countries to implement solutions at once, perhaps by tying tax avoidance solutions into participation in the World Trade Agreement. Are publishers actually helpful for knowledge dissemination? Or are scholars better off DIY? Melissa Terras' article in the Journal of Digital Humanities, The Impact of Social Media on the Dissemination of Research: Results of an Experiment found that tweeting her author's final version of papers in the institutional repository resulted in a significant increase in downloads. To me, this raises the question: is the role of publishers in disseminating and marketing research articles rapidly becoming obsolete? This would be an interesting question for altmetrics researchers to explore! Jeffrey Beall is the author of the important and useful list of predatory open access publishers, available on his Scholarly Open Access blog. Jeffrey reports that there is a concerted effort to discredit him and his work. To me this just highlights the importance of his work and the complete lack of ethics of those behind this effort. I applaud Jeffrey's service to the open access community, both through his list and through sharing this experience. Thanks, Jeffrey - please keep up the good work! A PDF of the whole dissertation can be downloaded from here. After the library audit, the thesis will be moved into the SFU Library Institutional Repository, SUMMIT, sometime in 2013. Another awesome year for open access! The Directory of Open Access Journals continues its steady increase at around 3 titles per day, to well over 8,000 titles. An easy prediction for the new year is that DOAJ is likely to exceed a million articles searchable at the article level early in 2013. Welcome to newcomer Directory of Open Access Books - already 35 publishers with over 1,200 free, peer reviewed academic books! OpenDOAR now lists over 2,200 open access archives, while Bielefeld Academic Search Engine now searches over 40 million documents, illustrating that these archives are far from empty. 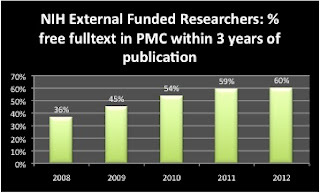 The chart above illustrating growth in percentage of NIH external fundees' research that is freely available within 3 years of publication growing from 34% to 60% shows steady growth - not the 100% that we'd all like to see, but constantly moving in the right direction. Meanwhile Beall's list of open access publishers continues to grow, too, illustrating that open access is getting lots of attention, and not always on the right side. On the fun side, flickr now has close to a quarter billion CC licensed photos - and note that 70% use the CC noncommercial element. If this Creative Commons is a democratic community, it's time to make NC the default! Wikimedia is now over 15 million items, and the Internet Archive recently surpassed one million movies. Details below - or download the full data edition. 200 million Creative Commons photos in flickr and counting! # free articles - no change from September; broken automated counter? 1 million moving images (movies); milestone! This year's list of predatory publishers includes over 225 highly-questionable scholarly publishing operations. Last year's list included only 23 publishers, and the 2010 list had about 18. This year's list of predatory stand-alone journals has 106 titles. (The previous year's list did not include stand-alone titles). Congratulations to Creative Commons, celebrating its 10th birthday from December 7 to 16th! 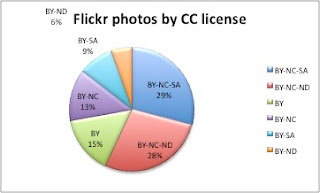 As of December 11, 2012, flickr contains close to a quarter of a billion CC licensed photos! flickr posts a list with the number of photos per license, which provides an opportunity to see which CC licenses are the most popular with flickr users. The two most popular licenses, accounting for more than half of the photos, are Attribution-Noncommercial-Sharealike (BY-NC-SA) (29%) and Attribution-Noncommercial-Noderivatives (BY-NC-ND) (28%). 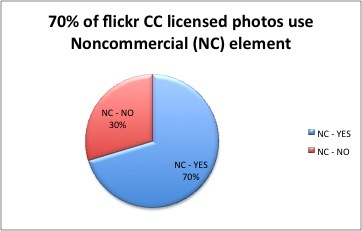 Of the CC license elements, the most popular by far is Noncommercial (NC). Over 173 million flickr photos - 70% of the flickr CC set - use NC. For a description of the Creative Commons license elements, see the CC Licenses page. Comment: this is particularly remarkable considering that the default CC license is CC-BY, and the CC license chooser deliberately tries to steer people away from NC and ND by labelling these as "not free culture" licenses. In other words, it takes effort to use these elements. If Creative Commons is meant to be a democracy, and if other communities using CC licenses show similar results, then NC should be the default. From my perspective, NC IS the free culture choice. This is the element that gives us a chance to share things and say that they do not belong to the realm of commerce. Following are some interesting research questions from Joseph Kraus, University of Denver, and my responses. 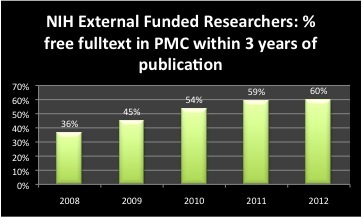 Q 1) The Finch report and the RCUK report recently came out. These reports have taken stances concerning green and gold open access in the UK. What are your thoughts on the issue of green vs gold open access policies? R 1) Open access policy should be green, not gold. Here are a few thoughts on why. I'd like to take a step back and talk about open access archiving (green) and open access publishing (gold). A healthy sustainable open access scholarly publishing system needs to have diverse components, because any one component will have vulnerabilities that other types are less susceptible to. A key limitation with open access publishing is that it cannot by itself look after ongoing preservation and access. Journals and publishers change over time. Journals cease to exist. Journals and publishers change hands; new owners may pursue a different business model. The RCUK policy which prefers gold open access with CC-BY has a huge vulnerability or loophole. A researcher who publishes in a journal using the CC-BY license has met the requirements of the open access policy. However, the journal has no obligation whatsoever to continue to provide open access or to continue to provide a version of the article under a CC-BY license. Creative Commons licenses make it possible to waive certain rights that we have under copyright; they place no obligations on the licensor. If each CC-BY licensed article is placed in one or more open access archives (I recommend more than one), then ongoing open access is secure even if the article does not remain open access on the publisher's website. Flatworldknowledge, an open textbooks publisher for 5 years which recently announced that as of January 2013 their books will no longer be free online, illustrates the danger - see their announcement about from free to fair. Green open access archives are essential for a sustainable open access system. The RCUK endorsement of CC-BY illustrates another problem with open access publishing mandates. It is understandable that RCUK would not want to fund open access options where publishers retain re-use rights for their own commercial purposes. However, CC-BY has other unintended consequences. CC-BY grants to anyone, anywhere commercial rights, and the right to create derivatives. Material provided by third parties may not be available for licensing via CC-BY. It would not be ethical to include material provided by research subjects (e.g. pictures, stories) under CC-BY without informed consent. Obtaining informed consent would require explaining the possible consequences; material using this license could be picked up by a for-pay image databank, for example, and so someone's picture could end up in an ad on the bus. The RCUK policy is only one example of an open access publishing or gold mandate. Where an open access publishing mandate makes sense is for funders that subsidize scholarly publishing per se, something that is common in many countries, but not the UK. Even here, a policy to make subsidized journals open or publicly accessible under fair use or fair dealing makes more sense than a more specific policy. That is, good policy provides the direction, the goal - it says what is to be done, but not necessarily how. The how is best left to the people who do the work (some might say the market). Q 2) PLOS ONE is a well-known large open access journal that covers a broad range of disciplines. Because it has been deemed successful, other publishers have also proposed or started similar journals. What is your opinion of this new type of publication outlet? R 2) It's about time that new forms of scholarly communication emerged! We can do so much more with the tools we now have available, it doesn't make sense to continue to publish online with the constraints that came with print. One important point to note about PLOS ONE is that it accepts all sound science. This just makes sense; the reason journals have high rejection rates (now seen as a badge of quality) is because in the print medium you can only fit in so many articles. This adds considerable waste to the system (rejected articles are usually still published, it's just that they tend to go through several rounds of review rather than just one). It's good to see competitors, too. Q 3) Harvard University has recommended to their faculty to “consider submitting articles to open-access journals, or to ones that have reasonable, sustainable subscription costs; move prestige to open access.” (http://isites.harvard.edu/icb/icb.do?keyword=k77982&tabgroupid=icb.tabgroup143448) The concept of “moving prestige to open access” is an interesting statement to the Harvard faculty authors and researchers. What do you think of this statement? R 3) Kudos and thanks to Harvard!!! The impact factor, locking in prestige and hence negotiating clout for journal owners, has been a major barrier in moving forward with developing a new, open access scholarly communication system. Q 4) University presses and many societies are concerned about how the open access movement will affect their financial bottom line. What concerns do you have about open access and society publications? R 4) I share this concern. One of the key points of my research is that the economic support for the current system comes from academic library budgets. Libraries should prioritize transitioning support for the system to open access. This isn't easy, but it needs to happen. Q 5) AltMetrics is gathering steam as an additional method for faculty to determine the impact of their work. (http://altmetrics.org) Do you plan to take advantage of this data for either your work, or for the benefit of your institution or department? R 5) I have serious concerns about the rush for AltMetrics, particularly AltMetrics based on social media. Before anyone even begins to think about using such metrics for assessing the work of scholars, much work needs to be done. For example, I argue that it is reasonable to hypothesize that any AltMetrics based on social media (whose work is tweeted, promoted on Facebook, etc.) is likely to reflect and amplify existing social biases. Men will be tweeted more than women, ethnic majorities more than ethnic minorities. Then there is strong potential for bias, both artefactual - e.g. a pharmaceutical company is likely to promote a study showing that their drug is effective, but not the one demonstrating the side-effect - and deliberate. Consider how climate change denial or big tobacco smoking is good for you proponents could manipulate social media to make their preferred research and researchers look good. Altmetrics is an approach with tremendous potential as a research project, but should not be used for assessing the work of scholars. Q 6) The Research Excellence Framework (REF) in the UK notes: "No sub-panel will make any use of journal impact factors, rankings, lists or the perceived standing of publishers in assessing the quality of research outputs." (http://www.ref.ac.uk/faq/all/) While this is a valid statement for UK based research evaluation, it would be impossible to get a majority of academic tenure and promotion committees throughout the United States to agree to a similar statement in the near future. Since the UK has the REF, and the US does not, how much is this holding back the US from adopting greater OA policies at various institutions? R 6) Open access is happening throughout the world. Each area can, does, and should, work within the context of the strengths, culture and history of its own region. The U.S. has been a very strong leader in open access policy, with the N.I.H. policy and the faculty permissions policies pioneered by Harvard, as well as open access publishing support by libraries. On the topic of the REF - to me, the REF approach exemplifies what I call irrational rationality, something to avoid and not to emulate. Q 7) Is there anything else you would like to say concerning open access publishing? R 7) My recommendation is library support for scholar-led publishing as the most cost-effective solution for the future. All this and much more is covered in my dissertation, "Freedom for scholarship in the internet age".